For other uses, see Password (disambiguation). For assistance with your Wikipedia password, see Help:Reset password. Despite the name, there is no need for passwords to be actual words; indeed passwords which are not actual words may be harder to guess, a desirable property. Some passwords are formed from multiple words and may more accurately be called a passphrase. The terms passcode and passkey are sometimes used when the secret information is purely numeric, such as the personal identification number (PIN) commonly used for ATM access. Passwords are generally short enough to be easily memorized and typed, although they may be longer and more complex if the user wishes to be more secure. 7 "The Password is dead"
The way in which they secure the passing round of the watchword for the night is as follows: from the tenth maniple of each class of infantry and cavalry, the maniple which is encamped at the lower end of the street, a man is chosen who is relieved from guard duty, and he attends every day at sunset at the tent of the tribune, and receiving from him the watchword—that is a wooden tablet with the word inscribed on it – takes his leave, and on returning to his quarters passes on the watchword and tablet before witnesses to the commander of the next maniple, who in turn passes it to the one next him. All do the same until it reaches the first maniples, those encamped near the tents of the tribunes. These latter are obliged to deliver the tablet to the tribunes before dark. So that if all those issued are returned, the tribune knows that the watchword has been given to all the maniples, and has passed through all on its way back to him. If any one of them is missing, he makes inquiry at once, as he knows by the marks from what quarter the tablet has not returned, and whoever is responsible for the stoppage meets with the punishment he merits. Passwords in military use evolved to include not just a password, but a password and a counterpassword; for example in the opening days of the Battle of Normandy, paratroopers of the U.S. 101st Airborne Division used a password—flash—which was presented as a challenge, and answered with the correct response—thunder. The challenge and response were changed every three days. American paratroopers also famously used a device known as a "cricket" on D-Day in place of a password system as a temporarily unique method of identification; one metallic click given by the device in lieu of a password was to be met by two clicks in reply. Passwords have been used with computers since the earliest days of computing. The Compatible Time-Sharing System (CTSS), an operating system introduced at MIT in 1961, was the first computer system to implement password login. CTSS had a LOGIN command that requested a user password. "After typing PASSWORD, the system turns off the printing mechanism, if possible, so that the user may type in his password with privacy." In the early 1970s, Robert Morris developed a system of storing login passwords in a hashed form as part of the Unix operating system. The system was based on a simulated Hagelin rotor crypto machine, and first appeared in 6th Edition Unix in 1974. A later version of his algorithm, known as crypt(3), used a 12-bit salt and invoked a modified form of the DES algorithm 25 times to reduce the risk of pre-computed dictionary attacks. The security of a password-protected system depends on several factors. The overall system must be designed for sound security, with protection against computer viruses, man-in-the-middle attacks and the like. Physical security issues are also a concern, from deterring shoulder surfing to more sophisticated physical threats such as video cameras and keyboard sniffers. Passwords should be chosen so that they are hard for an attacker to guess and hard for an attacker to discover using any of the available automatic attack schemes. See password strength and computer security for more information. Nowadays, it is a common practice for computer systems to hide passwords as they are typed. The purpose of this measure is to prevent bystanders from reading the password; however, some argue that this practice may lead to mistakes and stress, encouraging users to choose weak passwords. As an alternative, users should have the option to show or hide passwords as they type them. Effective access control provisions may force extreme measures on criminals seeking to acquire a password or biometric token. Less extreme measures include extortion, rubber hose cryptanalysis, and side channel attack. Some specific password management issues that must be considered when thinking about, choosing, and handling, a password follow. The rate at which an attacker can submit guessed passwords to the system is a key factor in determining system security. Some systems impose a time-out of several seconds after a small number (e.g., three) of failed password entry attempts. In the absence of other vulnerabilities, such systems can be effectively secure with relatively simple passwords, if they have been well chosen and are not easily guessed. Many systems store a cryptographic hash of the password. If an attacker gets access to the file of hashed passwords guessing can be done offline, rapidly testing candidate passwords against the true password's hash value. In the example of a web-server, an online attacker can guess only at the rate at which the server will respond, while an off-line attacker (who gains access to the file) can guess at a rate limited only by the hardware on which the attack is running. Passwords that are used to generate cryptographic keys (e.g., for disk encryption or Wi-Fi security) can also be subjected to high rate guessing. Lists of common passwords are widely available and can make password attacks very efficient. (See Password cracking.) Security in such situations depends on using passwords or passphrases of adequate complexity, making such an attack computationally infeasible for the attacker. Some systems, such as PGP and Wi-Fi WPA, apply a computation-intensive hash to the password to slow such attacks. See key stretching. An alternative to limiting the rate at which an attacker can make guesses on a password is to limit the total number of guesses that can be made. The password can be disabled, requiring a reset, after a small number of consecutive bad guesses (say 5); and the user may be required to change the password after a larger cumulative number of bad guesses (say 30), to prevent an attacker from making an arbitrarily large number of bad guesses by interspersing them between good guesses made by the legitimate password owner. Attackers may conversely use knowledge of this mitigation to implement a denial of service attack against the user by intentionally locking the user out of their own device; this denial of service may open other avenues for the attacker to manipulate the situation to their advantage via social engineering. Some computer systems store user passwords as plaintext, against which to compare user log on attempts. If an attacker gains access to such an internal password store, all passwords—and so all user accounts—will be compromised. If some users employ the same password for accounts on different systems, those will be compromised as well. More secure systems store each password in a cryptographically protected form, so access to the actual password will still be difficult for a snooper who gains internal access to the system, while validation of user access attempts remains possible. The most secure don't store passwords at all, but a one-way derivation, such as a polynomial, modulus, or an advanced hash function. Roger Needham invented the now common approach of storing only a "hashed" form of the plaintext password. When a user types in a password on such a system, the password handling software runs through a cryptographic hash algorithm, and if the hash value generated from the user's entry matches the hash stored in the password database, the user is permitted access. The hash value is created by applying a cryptographic hash function to a string consisting of the submitted password and, in many implementations, another value known as a salt. A salt prevents attackers from easily building a list of hash values for common passwords and prevents password cracking efforts from scaling across all users. MD5 and SHA1 are frequently used cryptographic hash functions but they are not recommended for password hashing unless they are used as part of a larger construction such as in PBKDF2. The stored data—sometimes called the "password verifier" or the "password hash"—is often stored in Modular Crypt Format or RFC 2307 hash format, sometimes in the /etc/passwd file or the /etc/shadow file. The main storage methods for passwords are plain text, hashed, hashed and salted, and reversibly encrypted. If an attacker gains access to the password file, then if it is stored as plain text, no cracking is necessary. If it is hashed but not salted then it is vulnerable to rainbow table attacks (which are more efficient than cracking). If it is reversibly encrypted then if the attacker gets the decryption key along with the file no cracking is necessary, while if he fails to get the key cracking is not possible. Thus, of the common storage formats for passwords only when passwords have been salted and hashed is cracking both necessary and possible. If a cryptographic hash function is well designed, it is computationally infeasible to reverse the function to recover a plaintext password. An attacker can, however, use widely available tools to attempt to guess the passwords. These tools work by hashing possible passwords and comparing the result of each guess to the actual password hashes. If the attacker finds a match, they know that their guess is the actual password for the associated user. Password cracking tools can operate by brute force (i.e. trying every possible combination of characters) or by hashing every word from a list; large lists of possible passwords in many languages are widely available on the Internet. The existence of password cracking tools allows attackers to easily recover poorly chosen passwords. In particular, attackers can quickly recover passwords that are short, dictionary words, simple variations on dictionary words or that use easily guessable patterns. A modified version of the DES algorithm was used as the basis for the password hashing algorithm in early Unix systems. The crypt algorithm used a 12-bit salt value so that each user's hash was unique and iterated the DES algorithm 25 times in order to make the hash function slower, both measures intended to frustrate automated guessing attacks. The user's password was used as a key to encrypt a fixed value. More recent Unix or Unix like systems (e.g., Linux or the various BSD systems) use more secure password hashing algorithms such as PBKDF2, bcrypt, and scrypt which have large salts and an adjustable cost or number of iterations. A poorly designed hash function can make attacks feasible even if a strong password is chosen. See LM hash for a widely deployed, and insecure, example. Passwords are vulnerable to interception (i.e., "snooping") while being transmitted to the authenticating machine or person. If the password is carried as electrical signals on unsecured physical wiring between the user access point and the central system controlling the password database, it is subject to snooping by wiretapping methods. If it is carried as packeted data over the Internet, anyone able to watch the packets containing the logon information can snoop with a very low probability of detection. Email is sometimes used to distribute passwords but this is generally an insecure method. Since most email is sent as plaintext, a message containing a password is readable without effort during transport by any eavesdropper. Further, the message will be stored as plaintext on at least two computers: the sender's and the recipient's. If it passes through intermediate systems during its travels, it will probably be stored on there as well, at least for some time, and may be copied to backup, cache or history files on any of these systems. Using client-side encryption will only protect transmission from the mail handling system server to the client machine. Previous or subsequent relays of the email will not be protected and the email will probably be stored on multiple computers, certainly on the originating and receiving computers, most often in clear text. The risk of interception of passwords sent over the Internet can be reduced by, among other approaches, using cryptographic protection. The most widely used is the Transport Layer Security (TLS, previously called SSL) feature built into most current Internet browsers. Most browsers alert the user of a TLS/SSL protected exchange with a server by displaying a closed lock icon, or some other sign, when TLS is in use. There are several other techniques in use; see cryptography. Unfortunately, there is a conflict between stored hashed-passwords and hash-based challenge-response authentication; the latter requires a client to prove to a server that they know what the shared secret (i.e., password) is, and to do this, the server must be able to obtain the shared secret from its stored form. On many systems (including Unix-type systems) doing remote authentication, the shared secret usually becomes the hashed form and has the serious limitation of exposing passwords to offline guessing attacks. In addition, when the hash is used as a shared secret, an attacker does not need the original password to authenticate remotely; they only need the hash. Rather than transmitting a password, or transmitting the hash of the password, password-authenticated key agreement systems can perform a zero-knowledge password proof, which proves knowledge of the password without exposing it. Moving a step further, augmented systems for password-authenticated key agreement (e.g., AMP, B-SPEKE, PAK-Z, SRP-6) avoid both the conflict and limitation of hash-based methods. An augmented system allows a client to prove knowledge of the password to a server, where the server knows only a (not exactly) hashed password, and where the unhashed password is required to gain access. Usually, a system must provide a way to change a password, either because a user believes the current password has been (or might have been) compromised, or as a precautionary measure. If a new password is passed to the system in unencrypted form, security can be lost (e.g., via wiretapping) before the new password can even be installed in the password database and if the new password is given to a compromised employee, little is gained. Some web sites include the user-selected password in an unencrypted confirmation e-mail message, with the obvious increased vulnerability. Identity management systems are increasingly used to automate issuance of replacements for lost passwords, a feature called self service password reset. The user's identity is verified by asking questions and comparing the answers to ones previously stored (i.e., when the account was opened). Some password reset questions ask for personal information that could be found on social media, such as mother's maiden name. As a result, some security experts recommend either making up one's own questions or giving false answers. "Password aging" is a feature of some operating systems which forces users to change passwords frequently (e.g., quarterly, monthly or even more often). Such policies usually provoke user protest and foot-dragging at best and hostility at worst. There is often an increase in the people who note down the password and leave it where it can easily be found, as well as helpdesk calls to reset a forgotten password. Users may use simpler passwords or develop variation patterns on a consistent theme to keep their passwords memorable. Because of these issues, there is some debate as to whether password aging is effective. Changing a password will not prevent abuse in most cases, since the abuse would often be immediately noticeable. However, if someone may have had access to the password through some means, such as sharing a computer or breaching a different site, changing the password limits the window for abuse. Allotting separate passwords to each user of a system is preferable to having a single password shared by legitimate users of the system, certainly from a security viewpoint. This is partly because users are more willing to tell another person (who may not be authorized) a shared password than one exclusively for their use. Single passwords are also much less convenient to change because many people need to be told at the same time, and they make removal of a particular user's access more difficult, as for instance on graduation or resignation. Separate logins are also often used for accountability, for example to know who changed a piece of data. Not displaying the password on the display screen as it is being entered or obscuring it as it is typed by using asterisks (*) or bullets (•). 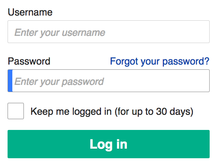 Requiring users to re-enter their password after a period of inactivity (a semi log-off policy). Enforcing a password policy to increase password strength and security. Some systems require characters from various character classes in a password—for example, "must have at least one uppercase and at least one lowercase letter". However, all-lowercase passwords are more secure per keystroke than mixed capitalization passwords. Providing an alternative to keyboard entry (e.g., spoken passwords, or biometric passwords). Requiring more than one authentication system, such as two-factor authentication (something a user has and something the user knows). Limiting the number of allowed failures within a given time period (to prevent repeated password guessing). After the limit is reached, further attempts will fail (including correct password attempts) until the beginning of the next time period. However, this is vulnerable to a form of denial of service attack. Introducing a delay between password submission attempts to slow down automated password guessing programs. Some of the more stringent policy enforcement measures can pose a risk of alienating users, possibly decreasing security as a result. It is common practice amongst computer users to reuse the same password on multiple sites. This presents a substantial security risk, since an attacker need only compromise a single site in order to gain access to other sites the victim uses. This problem is exacerbated by also reusing usernames, and by websites requiring email logins, as it makes it easier for an attacker to track a single user across multiple sites. Password reuse can be avoided or minimused by using mnemonic techniques, writing passwords down on paper, or using a password manager. It has been argued by Redmond researchers Dinei Florencio and Cormac Herley, together with Paul C. van Oorschot of Carleton University, Canada, that password reuse is inevitable, and that users should reuse passwords for low-security websites (which contain little personal data and no financial information, for example) and instead focus their efforts on remember long, complex passwords for a few important accounts, such as bank accounts. Similar arguments were made by Forbes in not change passwords as often as many "experts" advise, due to the same limitations in human memory. Historically, many security experts asked people to memorize their passwords: "Never write down a password". More recently, many security experts such as Bruce Schneier recommend that people use passwords that are too complicated to memorize, write them down on paper, and keep them in a wallet. According to a survey by the University of London, one in ten people are now leaving their passwords in their wills to pass on this important information when they die. One third of people, according to the poll, agree that their password protected data is important enough to pass on in their will. Many websites put certain conditions on the passwords their users may choose. These nearly always include standard rules such as minimum and maximum length, but also frequently include composition rules such as featuring at least one capital letter and at least one number/symbol. These latter, more specific rules were largely based on a 2003 report by the National Institute of Standards and Technology (NIST), authored by Bill Burr. It originally proposed the practice of using numbers, obscure characters and capital letters and updating regularly. In a 2017 Wall Street Journal article, Burr reported he regrets these proposals and made a mistake when he recommended them. According to a 2017 rewrite of this NIST report, many websites have rules that actually have the opposite effect on the security of their users. This includes complex composition rules as well as forced password changes after certain periods of time. While these rules have long been widespread, they have also long been seen as annoying and ineffective by both users and cyber-security experts. The NIST recommends people use longer phrases as passwords (and advises websites to raise the maximum password length) instead of hard-to-remember passwords with "illusory complexity" such as "pA55w+rd". A user prevented from using the password "password" may simply choose "Password1" if required to include a number and uppercase letter. Combined with forced periodic password changes, this can lead to passwords that are difficult to remember but easy to crack. Paul Grassi, one of the 2017 NIST report's authors, further elaborated: "Everyone knows that an exclamation point is a 1, or an I, or the last character of a password. $ is an S or a 5. If we use these well-known tricks, we aren’t fooling any adversary. We are simply fooling the database that stores passwords into thinking the user did something good." Attempting to crack passwords by trying as many possibilities as time and money permit is a brute force attack. A related method, rather more efficient in most cases, is a dictionary attack. In a dictionary attack, all words in one or more dictionaries are tested. Lists of common passwords are also typically tested. Password strength is the likelihood that a password cannot be guessed or discovered, and varies with the attack algorithm used. Cryptologists and computer scientists often refer to the strength or 'hardness' in terms of entropy. Passwords easily discovered are termed weak or vulnerable; passwords very difficult or impossible to discover are considered strong. There are several programs available for password attack (or even auditing and recovery by systems personnel) such as L0phtCrack, John the Ripper, and Cain; some of which use password design vulnerabilities (as found in the Microsoft LANManager system) to increase efficiency. These programs are sometimes used by system administrators to detect weak passwords proposed by users. On July 16, 1998, CERT reported an incident where an attacker had found 186,126 encrypted passwords. At the time the attacker was discovered, 47,642 passwords had already been cracked. In September, 2001, after the deaths of 960 New York employees in the September 11 attacks, financial services firm Cantor Fitzgerald through Microsoft broke the passwords of deceased employees to gain access to files needed for servicing client accounts. Technicians used brute-force attacks, and interviewers contacted families to gather personalized information that might reduce the search time for weaker passwords. In December 2009, a major password breach of the Rockyou.com website occurred that led to the release of 32 million passwords. The hacker then leaked the full list of the 32 million passwords (with no other identifiable information) to the Internet. Passwords were stored in cleartext in the database and were extracted through a SQL injection vulnerability. The Imperva Application Defense Center (ADC) did an analysis on the strength of the passwords. In June, 2011, NATO (North Atlantic Treaty Organization) experienced a security breach that led to the public release of first and last names, usernames, and passwords for more than 11,000 registered users of their e-bookshop. The data was leaked as part of Operation AntiSec, a movement that includes Anonymous, LulzSec, as well as other hacking groups and individuals. The aim of AntiSec is to expose personal, sensitive, and restricted information to the world, using any means necessary. On July 11, 2011, Booz Allen Hamilton, a consulting firm that does work for the Pentagon, had their servers hacked by Anonymous and leaked the same day. "The leak, dubbed 'Military Meltdown Monday,' includes 90,000 logins of military personnel—including personnel from USCENTCOM, SOCOM, the Marine corps, various Air Force facilities, Homeland Security, State Department staff, and what looks like private sector contractors." These leaked passwords wound up being hashed in SHA1, and were later decrypted and analyzed by the ADC team at Imperva, revealing that even military personnel look for shortcuts and ways around the password requirements. The numerous ways in which permanent or semi-permanent passwords can be compromised has prompted the development of other techniques. Unfortunately, some are inadequate in practice, and in any case few have become universally available for users seeking a more secure alternative. A 2012 paper examines why passwords have proved so hard to supplant (despite numerous predictions that they would soon be a thing of the past); in examining thirty representative proposed replacements with respect to security, usability and deployability they conclude "none even retains the full set of benefits that legacy passwords already provide." Single-use passwords. Having passwords which are only valid once makes many potential attacks ineffective. Most users find single use passwords extremely inconvenient. They have, however, been widely implemented in personal online banking, where they are known as Transaction Authentication Numbers (TANs). As most home users only perform a small number of transactions each week, the single use issue has not led to intolerable customer dissatisfaction in this case. Time-synchronized one-time passwords are similar in some ways to single-use passwords, but the value to be entered is displayed on a small (generally pocketable) item and changes every minute or so. PassWindow one-time passwords are used as single-use passwords, but the dynamic characters to be entered are visible only when a user superimposes a unique printed visual key over a server generated challenge image shown on the user's screen. Access controls based on public key cryptography e.g. ssh. The necessary keys are usually too large to memorize (but see proposal Passmaze) and must be stored on a local computer, security token or portable memory device, such as a USB flash drive or even floppy disk. The private key may be stored on a cloud service provider, and activated by the use of a password or two factor authentication. Biometric methods promise authentication based on unalterable personal characteristics, but currently (2008) have high error rates and require additional hardware to scan, for example, fingerprints, irises, etc. They have proven easy to spoof in some famous incidents testing commercially available systems, for example, the gummie fingerprint spoof demonstration, and, because these characteristics are unalterable, they cannot be changed if compromised; this is a highly important consideration in access control as a compromised access token is necessarily insecure. Single sign-on technology is claimed to eliminate the need for having multiple passwords. Such schemes do not relieve user and administrators from choosing reasonable single passwords, nor system designers or administrators from ensuring that private access control information passed among systems enabling single sign-on is secure against attack. As yet, no satisfactory standard has been developed. Envaulting technology is a password-free way to secure data on removable storage devices such as USB flash drives. Instead of user passwords, access control is based on the user's access to a network resource. Non-text-based passwords, such as graphical passwords or mouse-movement based passwords. Graphical passwords are an alternative means of authentication for log-in intended to be used in place of conventional password; they use images, graphics or colours instead of letters, digits or special characters. One system requires users to select a series of faces as a password, utilizing the human brain's ability to recall faces easily. In some implementations the user is required to pick from a series of images in the correct sequence in order to gain access. Another graphical password solution creates a one-time password using a randomly generated grid of images. Each time the user is required to authenticate, they look for the images that fit their pre-chosen categories and enter the randomly generated alphanumeric character that appears in the image to form the one-time password. So far, graphical passwords are promising, but are not widely used. Studies on this subject have been made to determine its usability in the real world. While some believe that graphical passwords would be harder to crack, others suggest that people will be just as likely to pick common images or sequences as they are to pick common passwords. 2D Key (2-Dimensional Key) is a 2D matrix-like key input method having the key styles of multiline passphrase, crossword, ASCII/Unicode art, with optional textual semantic noises, to create big password/key beyond 128 bits to realize the MePKC (Memorizable Public-Key Cryptography) using fully memorizable private key upon the current private key management technologies like encrypted private key, split private key, and roaming private key. Cognitive passwords use question and answer cue/response pairs to verify identity. That "the password is dead" is a recurring idea in computer security. It often accompanies arguments that the replacement of passwords by a more secure means of authentication is both necessary and imminent. This claim has been made by numerous people at least since 2004. Notably, Bill Gates, speaking at the 2004 RSA Conference predicted the demise of passwords saying "they just don't meet the challenge for anything you really want to secure." In 2011 IBM predicted that, within five years, "You will never need a password again." Matt Honan, a journalist at Wired, who was the victim of a hacking incident, in 2012 wrote "The age of the password has come to an end." Heather Adkins, manager of Information Security at Google, in 2013 said that "passwords are done at Google." Eric Grosse, VP of security engineering at Google, states that "passwords and simple bearer tokens, such as cookies, are no longer sufficient to keep users safe." Christopher Mims, writing in the Wall Street Journal said the password "is finally dying" and predicted their replacement by device-based authentication. Avivah Litan of Gartner said in 2014 "Passwords were dead a few years ago. Now they are more than dead." The reasons given often include reference to the usability as well as security problems of passwords. The claim that "the password is dead" is often used by advocates of alternatives to passwords, such as biometrics, two-factor authentication or single sign-on. Many initiatives have been launched with the explicit goal of eliminating passwords. These include Microsoft's Cardspace, the Higgins project, the Liberty Alliance, NSTIC, the FIDO Alliance and various Identity 2.0 proposals. Jeremy Grant, head of NSTIC initiative (the US Dept. of Commerce National Strategy for Trusted Identities in Cyberspace), declared "Passwords are a disaster from a security perspective, we want to shoot them dead." The FIDO Alliance promises a "passwordless experience" in its 2015 specification document. In spite of these predictions and efforts to replace them passwords still appear as the dominant form of authentication on the web. In "The Persistence of Passwords," Cormac Herley and Paul van Oorschot suggest that every effort should be made to end the "spectacularly incorrect assumption" that passwords are dead. They argue that "no other single technology matches their combination of cost, immediacy and convenience" and that "passwords are themselves the best fit for many of the scenarios in which they are currently used." Passwords are used on websites to authenticate users and are usually maintained on the Web server, meaning the browser on a remote system sends a password to the server (by HTTP POST), the server checks the password and sends back the relevant content (or an access denied message). This process eliminates the possibility of local reverse engineering as the code used to authenticate the password does not reside on the local machine. Transmission of the password, via the browser, in plaintext means it can be intercepted along its journey to the server. Many web authentication systems use SSL to establish an encrypted session between the browser and the server, and is usually the underlying meaning of claims to have a "secure Web site". This is done automatically by the browser and increases integrity of the session, assuming neither end has been compromised and that the SSL/TLS implementations used are high quality ones. ^ Improving Usability of Password Management with Standardized Password Policies Archived 2013-06-20 at the Wayback Machine (pdf). Retrieved on 2012-10-12. ^ Polybius on the Roman Military Archived 2008-02-07 at the Wayback Machine. Ancienthistory.about.com (2012-04-13). Retrieved on 2012-05-20. ^ Mark Bando (2007). 101st Airborne: The Screaming Eagles in World War II. Mbi Publishing Company. ISBN 978-0-7603-2984-9. Archived from the original on 2 June 2013. Retrieved 20 May 2012. ^ Morris, Robert; Thompson, Ken (1978-04-03). "Password Security: A Case History". Bell Laboratories. CiteSeerX 10.1.1.128.1635. ^ Vance, Ashlee (2010-01-10). "If Your Password Is 123456, Just Make It HackMe". The New York Times. Archived from the original on 2017-02-11. ^ "Managing Network Security". Archived from the original on March 2, 2008. Retrieved 2009-03-31. CS1 maint: BOT: original-url status unknown (link). Fred Cohen and Associates. All.net. Retrieved on 2012-05-20. ^ a b c d Lundin, Leigh (2013-08-11). "PINs and Passwords, Part 2". Passwords. Orlando: SleuthSayers. ^ The Memorability and Security of Passwords Archived 2012-04-14 at the Wayback Machine (pdf). ncl.ac.uk. Retrieved on 2012-05-20. ^ Michael E. Whitman; Herbert J. Mattord (2014). Principles of Information Security. Cengage Learning. p. 162. ISBN 978-1-305-17673-7. ^ Lewis, Dave (2011). Ctrl-Alt-Delete. p. 17. ISBN 978-1471019111. Retrieved 10 July 2015. ^ Techlicious / Fox Van Allen @techlicious (2013-08-08). "Google Reveals the 10 Worst Password Ideas | TIME.com". Techland.time.com. Archived from the original on 2013-10-22. Retrieved 2013-10-16. ^ Lyquix Blog: Do We Need to Hide Passwords? Archived 2012-04-25 at the Wayback Machine. Lyquix.com. Retrieved on 2012-05-20. ^ Stuart Brown "Top ten passwords used in the United Kingdom". Archived from the original on November 8, 2006. Retrieved 2007-08-14. . Modernlifeisrubbish.co.uk (2006-05-26). Retrieved on 2012-05-20. ^ Wilkes, M. V. Time-Sharing Computer Systems. American Elsevier, New York, (1968). ^ Schofield, Jack (10 March 2003). "Roger Needham". The Guardian. ^ The Bug Charmer: Passwords Matter Archived 2013-11-02 at the Wayback Machine. Bugcharmer.blogspot.com (2012-06-20). Retrieved on 2013-07-30. ^ a b Alexander, Steven. (2012-06-20) The Bug Charmer: How long should passwords be? Archived 2012-09-20 at the Wayback Machine. Bugcharmer.blogspot.com. Retrieved on 2013-07-30. ^ "passlib.hash - Password Hashing Schemes" Archived 2013-07-21 at the Wayback Machine. ^ a b Florencio et al., An Administrator's Guide to Internet Password Research Archived 2015-02-14 at the Wayback Machine. (pdf) Retrieved on 2015-03-14. ^ Cracking Story – How I Cracked Over 122 Million SHA1 and MD5 Hashed Passwords « Thireus' Bl0g Archived 2012-08-30 at the Wayback Machine. Blog.thireus.com (2012-08-29). Retrieved on 2013-07-30. ^ a b Morris, Robert & Thompson, Ken (1979). "Password Security: A Case History". Communications of the ACM. 22 (11): 594–597. CiteSeerX 10.1.1.135.2097. doi:10.1145/359168.359172. Archived from the original on 2003-03-22. ^ Password Protection for Modern Operating Systems Archived 2016-03-11 at the Wayback Machine (pdf). Usenix.org. Retrieved on 2012-05-20. ^ How to prevent Windows from storing a LAN manager hash of your password in Active Directory and local SAM databases Archived 2006-05-09 at the Wayback Machine. support.microsoft.com (2007-12-03). Retrieved on 2012-05-20. ^ "Why You Should Lie When Setting Up Password Security Questions". Techlicious. 2013-03-08. Archived from the original on 2013-10-23. Retrieved 2013-10-16. ^ a b Joseph Steinberg (12 November 2014). "Forbes: Why You Should Ignore Everything You Have Been Told About Choosing Passwords". Forbes. Archived from the original on 12 November 2014. Retrieved 12 November 2014. ^ "The problems with forcing regular password expiry". IA Matters. CESG: the Information Security Arm of GCHQ. 15 April 2016. Archived from the original on 17 August 2016. Retrieved 5 Aug 2016. ^ Schneier on Security discussion on changing passwords Archived 2010-12-30 at the Wayback Machine. Schneier.com. Retrieved on 2012-05-20. ^ Seltzer, Larry. (2010-02-09) "American Express: Strong Credit, Weak Passwords" Archived 2017-07-12 at the Wayback Machine. Pcmag.com. Retrieved on 2012-05-20. ^ "Ten Windows Password Myths" Archived 2016-01-28 at the Wayback Machine: "NT dialog boxes ... limited passwords to a maximum of 14 characters"
^ "To Capitalize or Not to Capitalize?" Archived 2009-02-17 at the Wayback Machine. World.std.com. Retrieved on 2012-05-20. ^ Thomas, Keir (February 10, 2011). "Password Reuse Is All Too Common, Research Shows". PC World. Archived from the original on August 12, 2014. Retrieved August 10, 2014. ^ Pauli, Darren (16 July 2014). "Microsoft: You NEED bad passwords and should re-use them a lot". The Register. Archived from the original on 12 August 2014. Retrieved 10 August 2014. ^ Kotadia, Munir (2005-05-23) Microsoft security guru: Jot down your passwords. News.cnet.com. Retrieved on 2012-05-20. ^ "The Strong Password Dilemma" Archived 2010-07-18 at the Wayback Machine by Richard E. Smith: "we can summarize classical password selection rules as follows: The password must be impossible to remember and never written down." ^ Bob Jenkins (2013-01-11). "Choosing Random Passwords". Archived from the original on 2010-09-18. "your password ... in a secure place, such as the back of your wallet or purse." ^ "Should I write down my passphrase?" Archived 2009-02-17 at the Wayback Machine. World.std.com. Retrieved on 2012-05-20. ^ Jaffery, Saman M. (17 October 2011). "Survey: 11% of Brits Include Internet Passwords in Will". Hull & Hull LLP. Archived from the original on 25 December 2011. Retrieved 16 July 2012. ^ Schneier, Real-World Passwords Archived 2008-09-23 at the Wayback Machine. Schneier.com. Retrieved on 2012-05-20. ^ MySpace Passwords Aren't So Dumb Archived 2014-03-29 at the Wayback Machine. Wired.com (2006-10-27). Retrieved on 2012-05-20. ^ "CERT IN-98.03". 1998-07-16. Retrieved 2009-09-09. ^ a b Urbina, Ian; Davis, Leslye (November 23, 2014). "The Secret Life of Passwords". The New York Times. Archived from the original on November 28, 2014. ^ "Consumer Password Worst Practices (pdf)" (PDF). Archived (PDF) from the original on 2011-07-28. ^ "NATO site hacked". The Register. 2011-06-24. Archived from the original on June 29, 2011. Retrieved July 24, 2011. ^ "Anonymous Leaks 90,000 Military Email Accounts in Latest Antisec Attack". 2011-07-11. Archived from the original on 2017-07-14. ^ "Military Password Analysis". 2011-07-12. Archived from the original on 2011-07-15. ^ "The Quest to Replace Passwords (pdf)" (PDF). IEEE. 2012-05-15. Archived (PDF) from the original on 2015-03-19. Retrieved 2015-03-11. ^ a b "Gates predicts death of the password". CNET. 2004-02-25. Archived from the original on 2015-04-02. Retrieved 2015-03-14. ^ Cryptology ePrint Archive: Report 2005/434 Archived 2006-06-14 at the Wayback Machine. eprint.iacr.org. Retrieved on 2012-05-20. ^ T Matsumoto. H Matsumotot; K Yamada & S Hoshino (2002). "Impact of artificial 'Gummy' Fingers on Fingerprint Systems". Proc SPIE. Optical Security and Counterfeit Deterrence Techniques IV. 4677: 275. doi:10.1117/12.462719. ^ Using AJAX for Image Passwords – AJAX Security Part 1 of 3 Archived 2006-06-16 at the Wayback Machine. waelchatila.com (2005-09-18). Retrieved on 2012-05-20. ^ Butler, Rick A. (2004-12-21) Face in the Crowd Archived 2006-06-27 at the Wayback Machine. mcpmag.com. Retrieved on 2012-05-20. ^ graphical password or graphical user authentication (GUA) Archived 2009-02-21 at the Wayback Machine. searchsecurity.techtarget.com. Retrieved on 2012-05-20. ^ Ericka Chickowski (2010-11-03). "Images Could Change the Authentication Picture". Dark Reading. Archived from the original on 2010-11-10. ^ "Confident Technologies Delivers Image-Based, Multifactor Authentication to Strengthen Passwords on Public-Facing Websites". 2010-10-28. Archived from the original on 2010-11-07. ^ User Manual for 2-Dimensional Key (2D Key) Input Method and System Archived 2011-07-18 at the Wayback Machine. xpreeli.com. (2008-09-08) . Retrieved on 2012-05-20. ^ "IBM Reveals Five Innovations That Will Change Our Lives within Five Years". IBM. 2011-12-19. Archived from the original on 2015-03-17. Retrieved 2015-03-14. ^ Honan, Mat (2012-05-15). "Kill the Password: Why a String of Characters Can't Protect Us Anymore". Wired. Archived from the original on 2015-03-16. Retrieved 2015-03-14. ^ "Google security exec: 'Passwords are dead'". CNET. 2004-02-25. Archived from the original on 2015-04-02. Retrieved 2015-03-14. ^ "Authentciation at Scale". IEEE. 2013-01-25. Archived from the original on 2015-04-02. Retrieved 2015-03-12. ^ Mims, Christopher (2014-07-14). "The Password Is Finally Dying. Here's Mine". Wall Street Journal. Archived from the original on 2015-03-13. Retrieved 2015-03-14. ^ "Russian credential theft shows why the password is dead". Computer World. 2014-08-14. Archived from the original on 2015-04-02. Retrieved 2015-03-14. ^ "NSTIC head Jeremy Grant wants to kill passwords". Fedscoop. 2014-09-14. Archived from the original on 2015-03-18. Retrieved 2015-03-14. ^ "Specifications Overview". FIDO Alliance. 2014-02-25. Archived from the original on 2015-03-15. Retrieved 2015-03-15. ^ "A Research Agenda Acknowledging the Persistence of Passwords". IEEE Security&Privacy. Jan 2012. Archived from the original on 2015-06-20. Retrieved 2015-06-20.